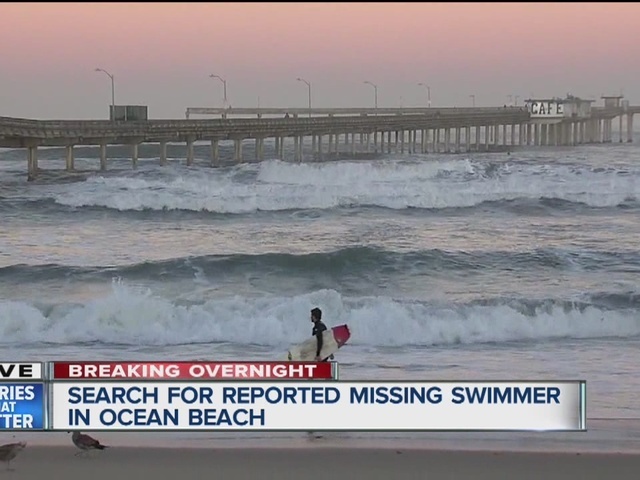 SAN DIEGO – Helicopters, police and lifeguards searched the water around the Ocean Beach Pier early Monday morning for a possible missing swimmer, but found no evidence that someone had drowned. At around 2 a.m., a female called 911 to report that she had found a person’s clothes lying along a seawall in Ocean Beach. She thought the person the clothes belonged to may be missing. She added that she had seen someone in the area between midnight and 1 a.m.
San Diego police and lifeguards responded and began a search of the area, assisted by police choppers. No evidence was found of a drowning, and the search was eventually called off. However, just after 6:30 a.m., the U.S. Coast Guard launched an aerial search of the area. A helicopter was searching the shoreline from Ocean Beach to Bird Rock. The search continued through 7:30 a.m. There were no new leads that prompted the second search, a Coast Guard spokesperson said. According to the Coast Guard, the helicopter chose that search radius because models show that a person would have floated from Ocean Beach to Bird Rock based on currents, winds and weather patterns.